Copied from an original in the Neumann collection, this example shows attempts made by Americans to weatherproof their cartridge boxes. It is made with heavy saddle leather hard gores over which the flap fitted more or less snugly. The wooden block has clipped edges and holes for 24 cartridges. 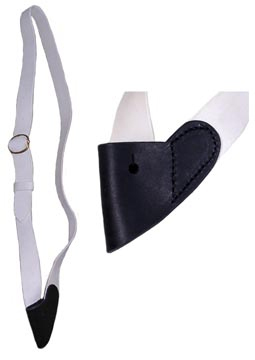 The white straps have two #62 buckles and are about 1 3/4" wide. The strap is included. This is one of the finer American cartridge boxes.